Avtivision has finally brought their mind bending Geometry Wars game to the App Store, and it is only here for the iPad, so you won’t find it for your iPhone or iPod touch. Ready to obliterate endless swarms of attacks in this live arcade style shooter? Geometry Wars beholds a large passionate fan base. 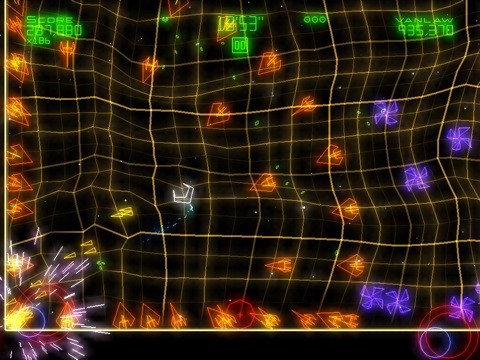 If you’re not familiar with Geometry Wars, think of it as shooting mayhem. Geo Wars is a legendary shooter with insanely colorful graphics, fast paced action and packed with upbeat trance music and glowing explosions. If you’re a fan of games that tax your playing dedication to improve your skills, and want a good challenge and turbo powered festival of exploding lights, Geometry Wars is a must have game for your iPad. The iPad version is exclusively blessed with a brand new level called Titans. This is in addition to the 6 base gameplay modes including Deadline, King, Evolved, Pacifism, Waves and Sequence. Since normal playing sessions in Geo Wars can take upwards of 20 minutes, in the iPad version you’re able to play short 5 or 10 minute sessions. AppSafari review of Geometry Wars Touch for iPad was written by Joe Seifi on April 2nd, 2010 and categorized under Action, App Store, Featured, Games, iPad apps. Page viewed 4181 times, 2 so far today. Need help on using these apps? Please read the Help Page.